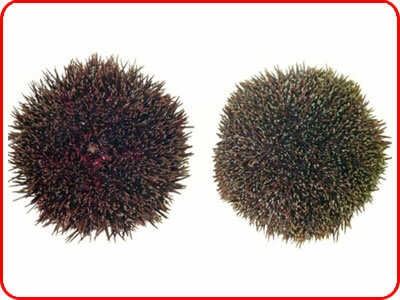 Kina or sea eggs are a staple Maori food for those fortunate enough to live close to the sea. Kina is found at low tide in rock crevices and under ledges of rock. They should only be gathered however in summer when they are sweet. Maori lore says it is best for them to be gathered at low tide on the first, second and third days after a full moon. 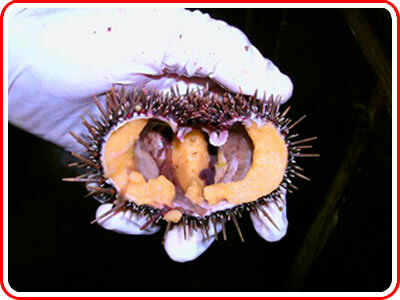 When opened the shell will be found to contain a mass of fine grit and shell, a purple membrane and five tongues which are red. The tongues should be scraped from the shell with a spoon taking care not to include any membrane or grit. 1. Place alternate layers of kina and breadcrumbs, into a buttered Pie dish finishing with a layer of breadcrumbs. 2. Cover with chopped bacon. 3. Bake at 350 degrees for about 30 minutes until the crumbs and bacon are crisp and the tongues are cooked.